Theodore Dwight Weld, 1803-1895 American Slavery As It Is: Testimony of a Thousand Witnesses. 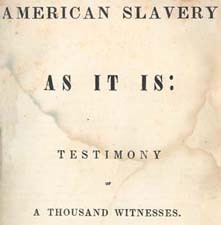 American Slavery As It Is: Testimony of a Thousand Witnesses. New York: American Anti-Slavery Society, 1839.